Irish crochet necklets in black, storm, grey, dunes, silver and white. Irish crochet necklet in black, showing how it ties. Buglets necklets make a unique gift. They are versatile and can be worn in a variety of ways around the neck - either short or long - or even around the wrist as a bracelet. They are very comfortable to wear, and are perfect for sensitive skins - they are so soft and comfortable you'll forget you are wearing it! 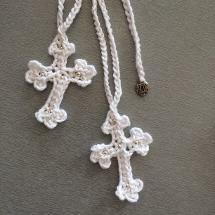 Irish crochet and cross necklets tie at the back of the neck, and can be worn as long or short as desired. Flower necklet has a movable flower that can adjust to the height you prefer, or moved to the end so that the entire necklet can be wrapped around your neck or arm, and looped over the flower. 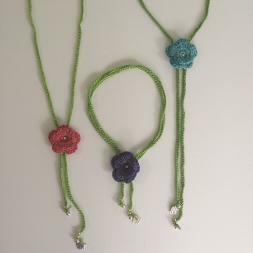 Necklaces are made using a variety of nickel-free beads and either hemp or bamboo, R75 each. 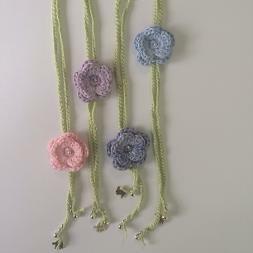 Flower necklets in raspberry, violet and turquoise, showing different ways they can be worn.